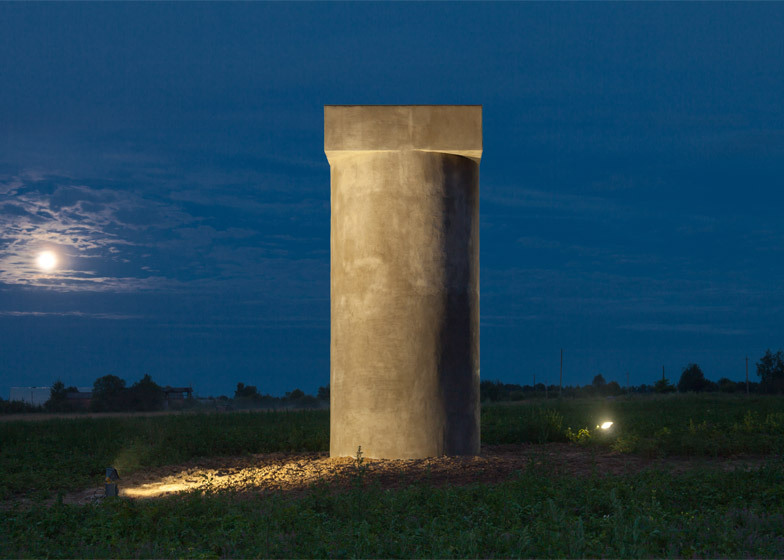 This museum by architects Sergei Tchoban and Agniya Sterligova contains a single room inside a silo-like structure in a Russian potato field (+ slideshow). 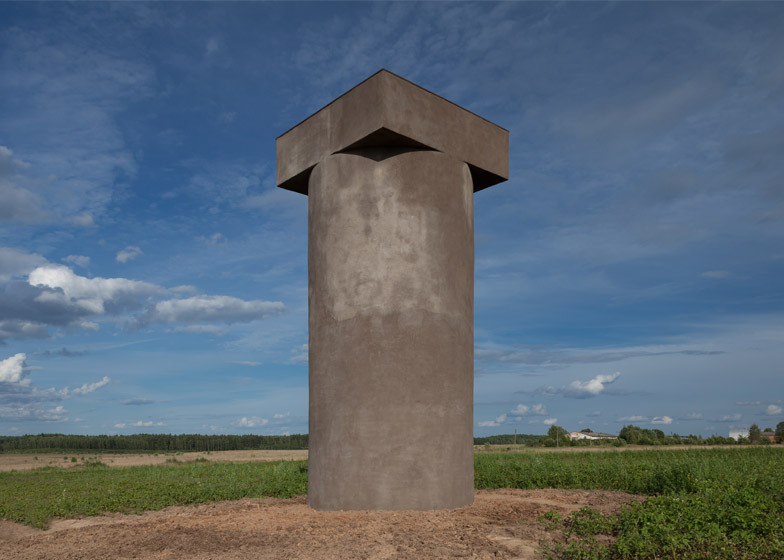 Designed by Russian architects Tchoban and Sterligova to honour to the region's agricultural history, the Museum of Rural Labor is built from compacted clay and straw – a traditional construction method in rural Russia. 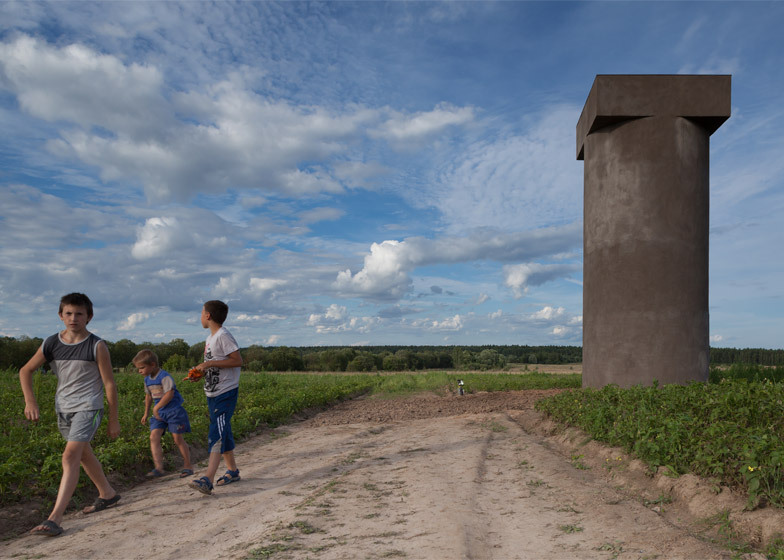 The building sits among crop furrows in a potato field near Zvizzhi, a village located around 120 miles south-west of Moscow. 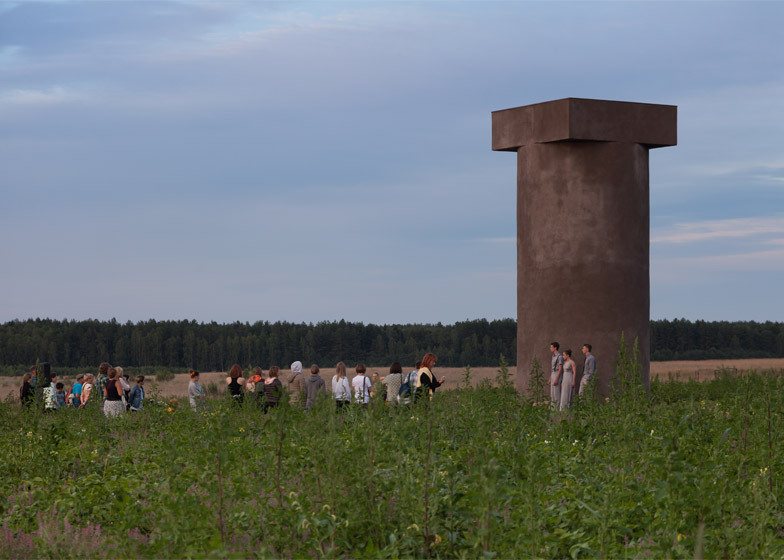 It was designed as part of Archstojanie, an annual land-art festival hosted in Nicola Lenivets, a local artist community founded by Nikolay Polissky. 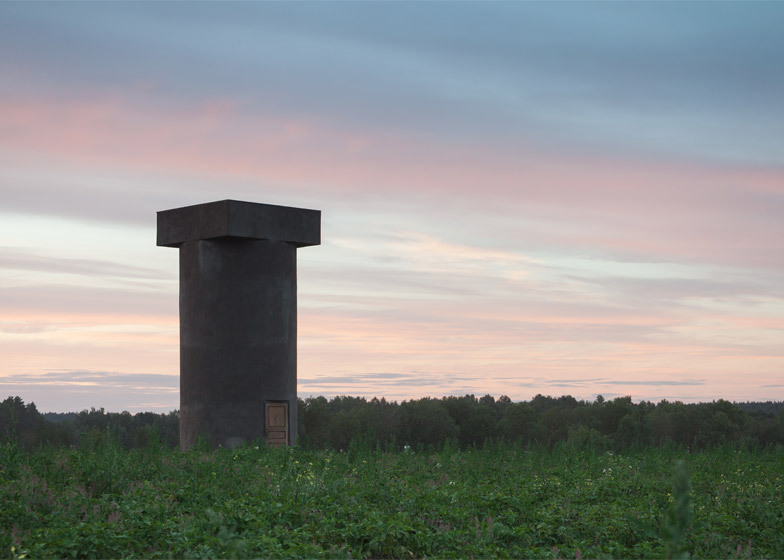 Polissky recently covered a dilapidated building in the village in timber offcuts to create a walk-through sculpture for the event. 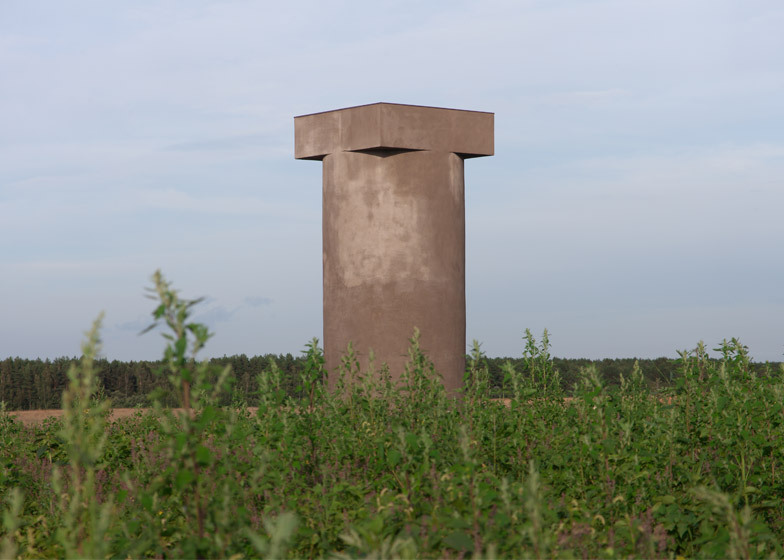 Tchoban and Sterligova's cylindrical structure is topped by a one-metre-thick square capital, which forms its roof. 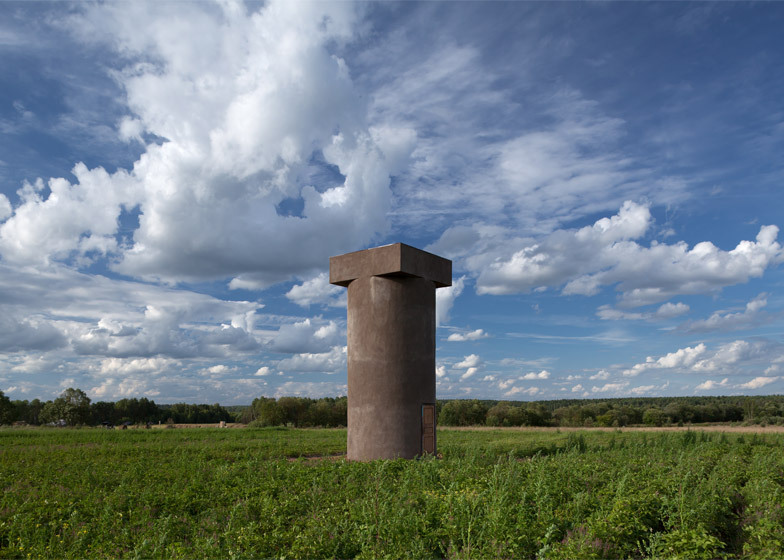 "Visually, this structure calls to mind all kinds of associations – from a banal water tower to the last surviving column of a no longer existent acropolis," said Tchoban and Sterligova. 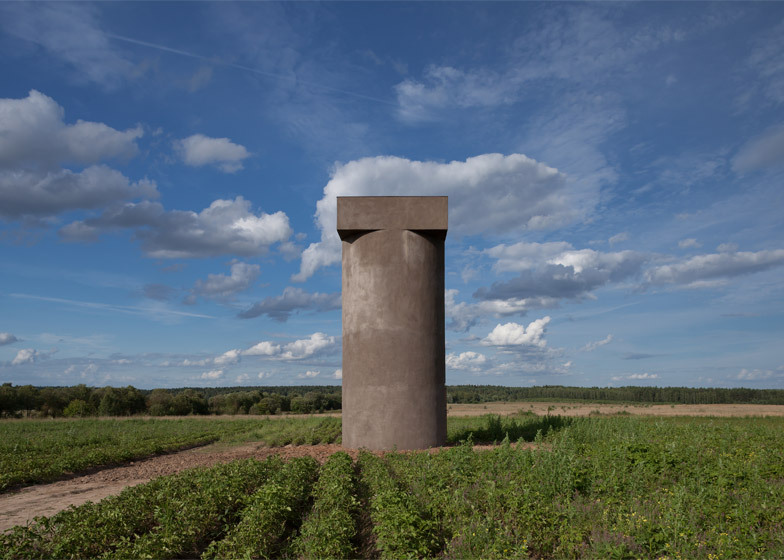 "With its silhouette of a silo tower, the object is implemented artfully to the landscape of the village." 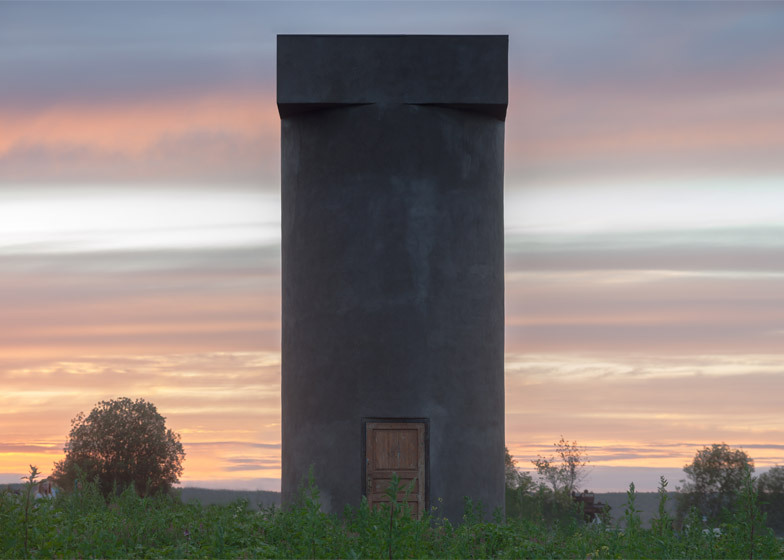 "An outside observer would find it quite difficult to evaluate the structure's true scale," they added, "being clad with clay, the tower seems to merge with its earth base and with its surroundings in general; you might easily think it has been here forever." 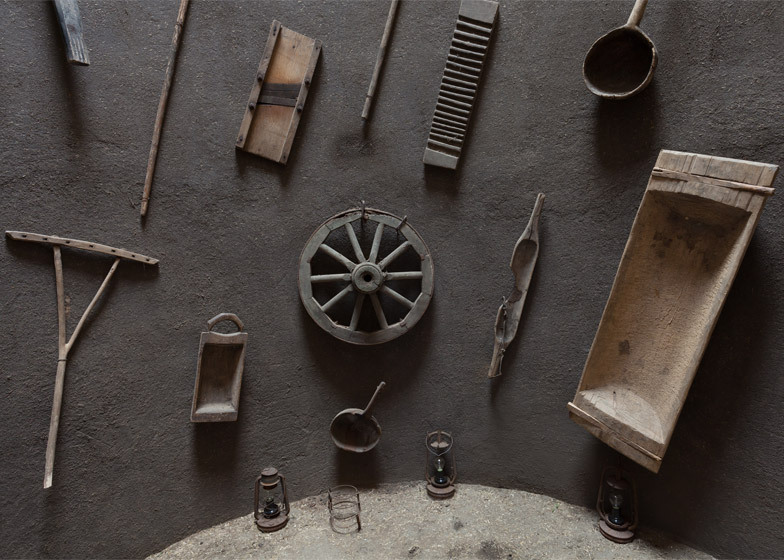 While the outer walls of the eight-metre-tall museum are free from ornament, the inner walls are embellished with agricultural tools and artefacts collected from nearby villages and settlements that pay tribute to the area's rich farming history. 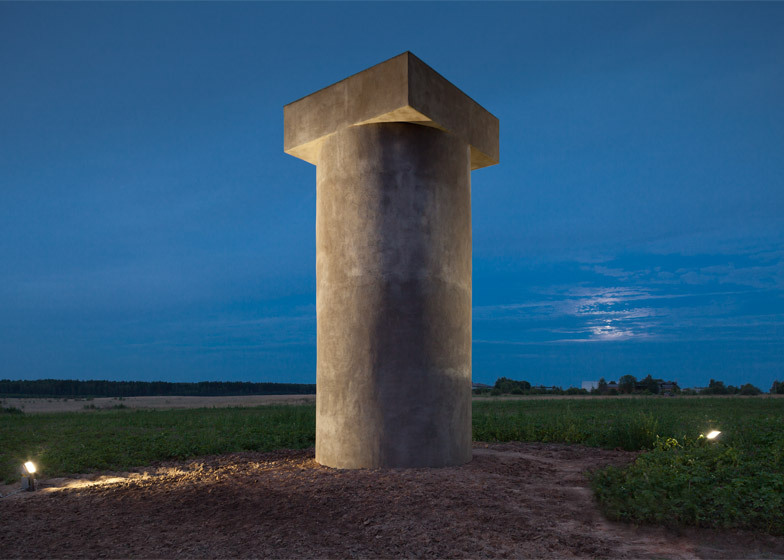 "Positioned in a spiral, these artefacts seem to be rising into the sky, underlining the sacral importance of work on the land, work which has always been the basis for man's wellbeing," said the architects. 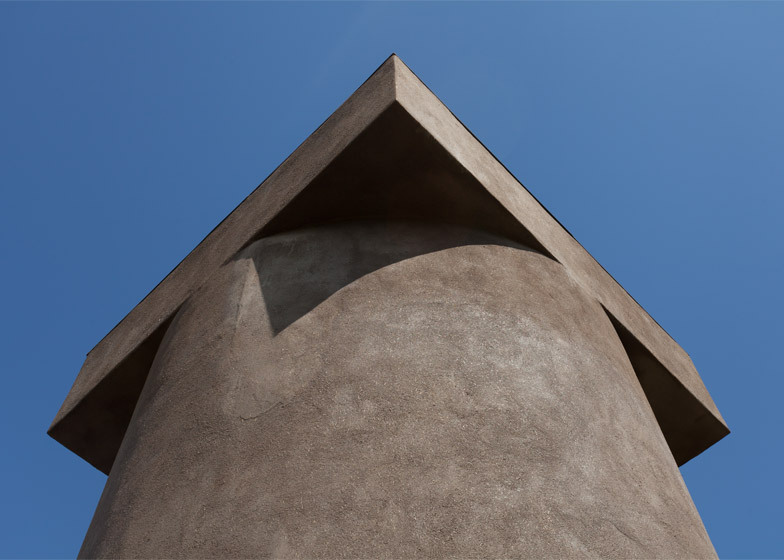 A wooden door at one side of the tower opens directly from the field into the single-room museum, which is just 3.2 metres wide and is lit by a circular skylight in the thick roof slab. The yellow-tinged glass is intended to bath the interior in golden light, enhancing the earthy tones of the clay. 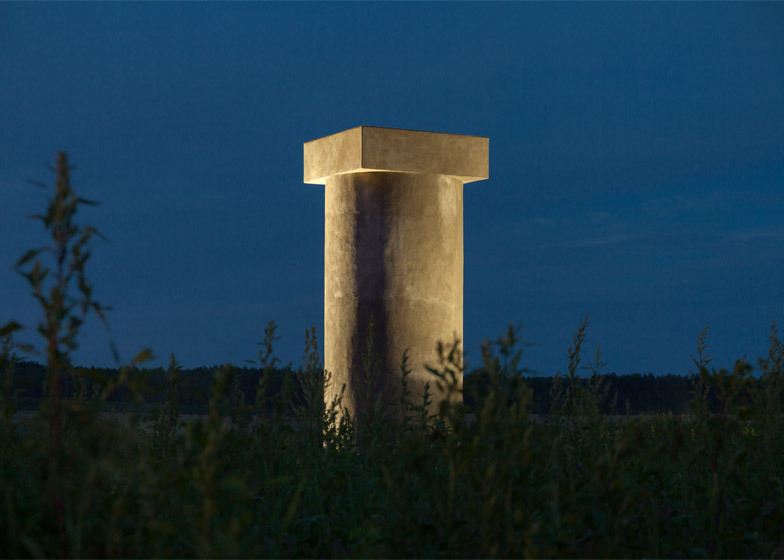 Sergei Tchoban is also the architect behind Russia's pavilions for this year's World Expo in Milan and for the Venice Architecture Biennale in 2012. The former features a vast 30-metre-long mirrored cantilever hosting a roof garden, while the latter had surfaces covered in QR codes that visitors could use mobile phones and tablets to read. Among his permanent buildings are a hotel in Berlin that also features a mirrored cantilever containing its upper storeys and a museum for architectural drawings, which has walls decorated with architectural motifs.